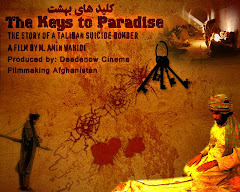 Deedenow Cinema Production Afghanistan: Afghanistan does not need terrorist training centers anymore! 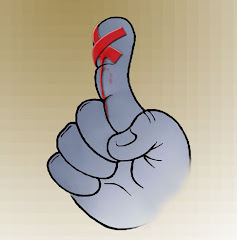 Afghanistan does not need terrorist training centers anymore! 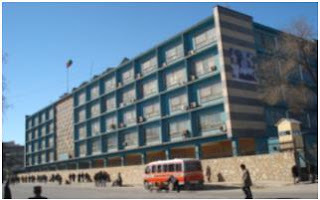 The Ministry of Education of Afghanistan has announced that some of the donor countries are not ready to assist this ministry for construction of religious schools which costs about 200 millions dollars and this ministry has hoped to be able get support of some Arab countries for this project. This ministry argues that by construction of these religious schools within Afghanistan the Afghan youth avoid referring to Madrasas in Pakistan where they are being mislead, trained and misused for terrorist purposes, while the donor countries have their own reasons. 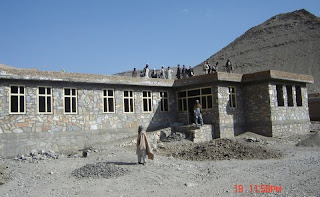 These donor countries argue that construction of special religious schools in this period of time would be a waste of time and money because currently Afghanistan first needs enough number of ordinary public schools rather the specific religious schools which may be the secondary need and then after construction and completion ordinary public schools, that could be an option to think about. 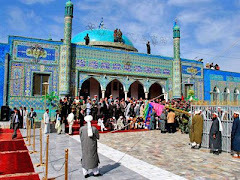 At the same time the experiences in other countries of the region like Pakistan has shown that these religious schools can turn into terrorist training centers in long term, which is the main concern of the western donors of Afghanistan. 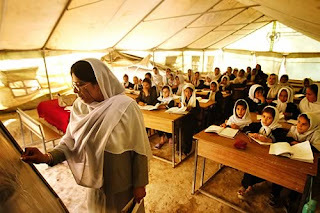 Education is one of the main sectors to be invested on and improved in developing countries like Afghanistan. 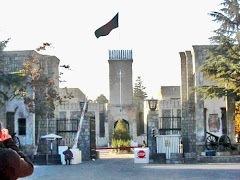 Most of the infrastructures of Afghanistan have been damaged in the wars and among the other sectors, education has been affected very badly and is difficult to compensate the loss and damages of this sector in short term, but with a full faith, loyalty and hard working and concrete planning, things can get better. 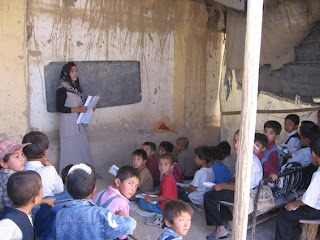 Although this sector has been under focus and there have been assistances for education system in Afghanistan by different donor countries namely Japan, the USA, India, Norway* etc during these years, but the damages in educational system of Afghanistan were more than to be amended this quickly and the need to have a developed educational system does not seem to be felt by the responsible officials yet, but perhaps within next fifteen to twenty years the Afghans will suffer lack of educated and professional cadres in the country. 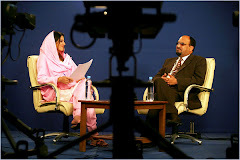 This problem is not only in the primary and secondary but in higher education too; as a result currently a bachelor degree obtained in Afghanistan does not match with the standard of other countries which is just one example of tens and need more detailed discussions but in this writing we focus only on the activities of Ministry of Education not Ministry of Higher Education. In Ministry of Education on the other hand, unfortunately due to misuse of funds and wastage of time there are still a lot of problems in three aspects; the contents of educational curriculum, capacity and privileges of the teachers and the condition of educational structures like school buildings, facilities and furniture. The contents of the current educational curriculum in school text books are not updated, which is again because of the lack of a long term plans and a far vision of education. There have been revisions on school text books in these years, but still because of existence of corruption, appointment of insufficient people in the compilation and translation department of Ministry of Education and of course, NGOism in this ministry all the efforts were useless and a waste of time and money when there was a low quality outcome in the new printed books; with a lot of mistakes as well as very costly. Because of lack of long term or at least mid term trainings for teachers, most of the teachers in primary and middle education levels are unprofessional. Mostly after finishing high schools, to do a job, people tend to become a teacher in one of the primary or middle schools even before attending university or teacher training institutes. On the other hand, the professional teachers, most of whom are already old complain about the salary the government pay them. 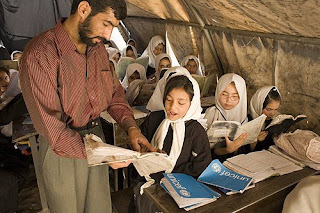 School teachers are paid a monthly salary of 2000 to 2500 Afghanis which is equivalent to 40 t0 50 dollars while the very primary needs of life costs at least three to four times of this salary, therefore the teachers have to do some other jobs in addition to their teaching; as a result they don’t have to pay attention in their teaching quality and improvement of method of teaching. Teachers are paid this amount of salary while in the ministry of education the expenditure of Minister’s Office and his monthly pocket money is more than thousands of dollars which is paid from the public wealth while at the same time only the over time salaries of Minister’s advisors are hundreds of dollars. Latest serious of strikes, demonstrations and objections of the teachers in many cities of Afghanistan has revealed that even though their salary is very low, they are not able to receive it on regular basis. The teachers are not paid for three to four months, in this situation what can we expect from education of our next generation?! 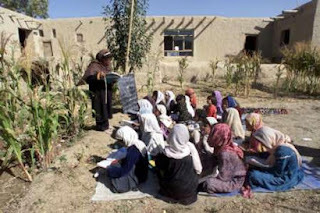 Although millions of Dollars are being assisted to the Ministry of Education of Afghanistan for primary and secondary education but unfortunately due to existence of a corrupted administration and over shadow of negative NGOism* in this ministry most of the funds are being misused and or embezzled as a result many schools are even without basic facilities like class rooms, chairs or black boards, instead the students attend in under - the - tent - schools or in the open air on the dust. This situation is born due to existence of injustice, discrimination and financial corruption that is rooting in this country. The poor and the deprived provinces are still without school buildings and the people of those areas do not have a voice to ask the government for a justice or perhaps no one listen to them. Most of the schools that are so far built by national NGOs are not so good because of use of low quality construction materials in the projects and embezzlement of a big percentage of the funds. A school project that is announced 100,000 dollars in reality only 20,000 dollars are spent on that project and 80,000 is being embezzled by two or three parties; representatives of Ministry of Education, the contracting NGO and even sometimes by the people in the donor organizations. As a result the project is very low quality and will not last for a long time. After two or three years, these schools get ruined again because of cheap construction materials. Who benefits from these projects and who suffer is clear; Of course, only a few people will benefit for their NGO business and the people of Afghanistan will suffer the low quality and weak structured school buildings and educational compounds. In this regard there are many complaints and petitions by the people of different provinces in the Commission of Complaints of Wolusi Jirga (the lower house of the parliament) but because of lack of an overseeing role by the parliament no actions is taken so far. Any time the minister of education appears before media and press, he announces just the numbers and figures and statistics of schools being built just as words in the air, but never talks about the quality of these schools. On the other hand, in practice there has not been a strong auditing and overseeing body so far to do an oversight on what the minister claims, while there are many evidences for his lies that can prove totally the vice versa than what the Minister of Education claims. Therefore it would be better that the Minister of Education would wake up and really work for an ideal educational system and bring a betterment in this system then think about other additional structures and projects in this ministry. Once again we emphasize it would be better for he people of Afghanistan not to spend funds for specific religious schools extra than ordinary public schools which are the real need in this period of time, but instead the contents of religious subjects in ordinary schools should be enriched. And if specific Arab countries would assist this ministry to build religious schools in Afghanistan, we concern once again there will be an open way for the entrance of the fundamentalists and extremists into Afghanistan through these schools. Worse than that, we are afraid of repetition of the mistakes we did during the 1980s and 1990s and that is to give an open hand to foreign interference in our internal affairs by the name of religion and religious brothers. But before taking in hand this project, it would be better for transparency of this ministry, if Minister of Education would kindly answer some very important questions. “What has done this ministry so far with its current ordinary public schools in different corners of the country? Why this ministry does not have a transparent accountability for the nation and international community? Why there is still injustice in rebuilding of those schools in different deprived provinces such as, Nooristan, Daikundi, Kunar, Bamyan etc? Why the basic salaries of the teachers are not paid in many provinces? Why there is still corruption in different levels of departments of this ministry? Why the quality of the text books for national level is not good? Why there are still cheating in documentations of this ministry? Why insufficient and low educated people are appointed in important positions as advisors or so in this ministry?” And many more questions that the Ministry of Education has to answer them clearly and then claim for further assistances for its extra plans.